The wooden box-like item with the gold EK arms is a reliquary. In its center is a glass capsule of earth from Countess Diana Listmaker's old backyard on Oregon St. in Berkeley, CA: the listfield of the First Tournament that started the SCA. It had been in the archives for many years without being put to any use: it was presented to the Kingdom at the Thirty Year Celebration. The blue box is the casket of the Ampullae. They contain two cruets, one of olive oil and one of water from San Francisco Bay. The blue box is used in Unction, or Anointing. In a coronation, THIS, not the crowning, is what conveys the kingship. The reliquary is a sacred object on which the king and queen may swear their oath. When then-Prince Kenric of Warwick and Princess Avelina Keyes were contemplating their first coronation, it occurred to Steffan ap Cenydd of Silverwing that they could use, largely verbatim, the 10th-century •ordo• of Æthelræd the Unready, which he had, and which featured Anointing as a central element. They all considered what to do about this, since they couldn't claim (as in France and England) that the oil was brought personally from Heaven by a saint. They considered getting a bottle of seawater from SF bay, since that was where the SCA was born. Sort of like the shores of Avalon, or Valinor. How can we get that? It turns out we knew a guy (and a gal). Then-Prince Ajax and Princess Uta of the Mists happened to attend Birka that year, and were very enthusiastic about this idea. Now, all we asked for was, and all we expected, was a coke bottle full of seawater. What we got was this. it was made by Princess Uta herself: it's a painted, velvet-lined casket with the two cruets, and an Anointing Spoon. The box says on the front "We reign because they believe": this is taken from the crowns of Caid, which have this engraved on the inner band. The top says "From the Bay of the Mists, whereat the World was born". This State Gift is a true treasure and a token of the friendship between the principality of the Mists and the kingdom of the East. "By this unction of water from The Bay of the Mistlands, whereat the World was born, be reminded of those who have come before, those who by steadfast courage have conquered kingdoms, enforced justice, and gained the everlasting praise of Eastern folk. Let this remembrance descend upon you internally, and penetrate your heart, that you may may reign happily in the present life and that you be rendered worthy of inclusion in the rolls of those great persons who have preceded you." 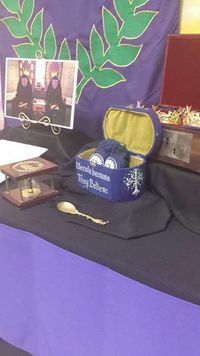 These relatively recent additions to the Coronation regalia were reportedly the subjects of much admiration and comment at the SCA 50th Year event. This page was last edited on 5 July 2016, at 13:58.